Home Recipes & FoodDinner	Fake ‘N’ Bake Empanadas! It’s hard to be adventurous in the kitchen every single day. Sometimes you just need a gimme meal. These easy fake’n’bake empanadas are perfect for a busy weeknight when you don’t have a lot of time! Maybe you got good deal on ground beef and want to do something different and easy. Maybe you just like empanadas. Whatever works for you! I don’t judge. I don’t claim this recipe to be all that original, or authentic. But it sure was good! 5) Spoon filling onto each triangle, roll, and bake! 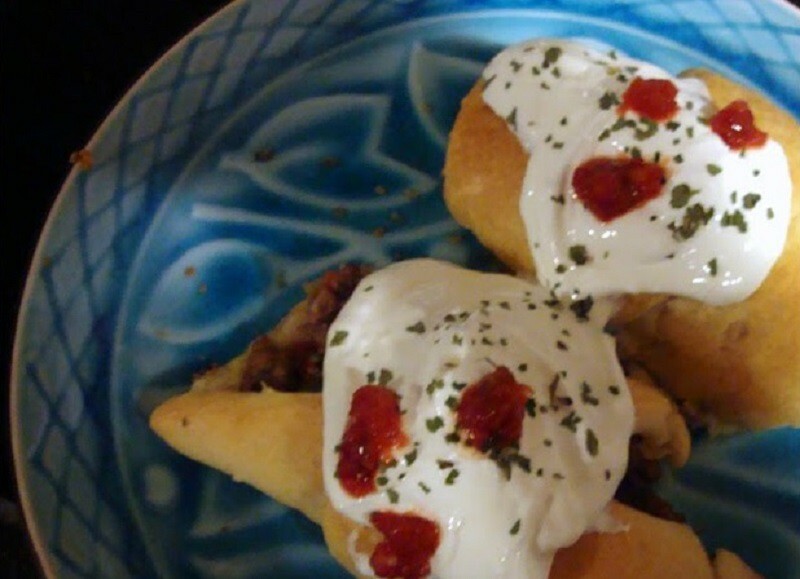 6) Top with Sour Cream and hot sauce. Yum! I used a little less than a pound of beef and had WAY too much filling for 8 croissants, just to give you an idea. I piled the rest in a pizza crust and folded it over to take care of the leftovers. That was good too, but the croissant went better with the mixture. Reader Response: What’s in a Name? My blog http://www.remodelaholic.com is all about interior design and remodeling there are some great tutorials so you can get the look you want on a budget! We also have a party every Friday to show off your stuff!! That looks YUMMY! Happy Friday Follow. I'm following you, now! Thanks for stopping by… I'm following you back. Thank you for sharing this amazing recipe! I am very much looking forward to baking it. I do have two questions, though. How long do you bake this deliciousness for and what temperature in the oven? Thank you once again. Hi Kristen! Thanks for reading. I just followed the cooking instructions on the croissant rolls so I recommend doing the same with whichever brand you use. Enjoy! I made these tonight and they came out awesome! Super simple and easy. Thanks for sharing!